282 pages | 14 B/W Illus. At the forefront of research on English language teacher education and professional development, this volume presents new empirical research situated in different contexts around the world, including Canada, Denmark, Israel, Japan, Korea, Qatar, Sudan, and the U.S. It is framed by the volume editors’ insightful overview and analyses of previous and ongoing work in a variety of related domains and an epilogue by David Nunan. 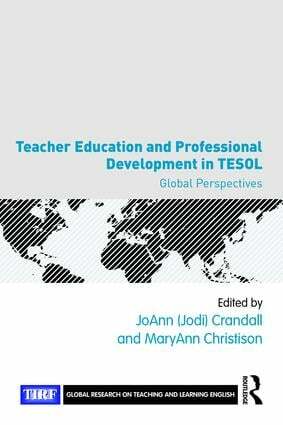 The chapter studies are organized around three themes: teacher identity in ESL/EFL teacher education and professional development programs, second language teacher education programs for diverse contexts, and professional development for diverse contexts. All chapters focus on the applied nature of the research and include a section on implications. To provide balance and a range of views, the volume includes both chapters reporting on empirical research funded by TIRF grant recipients and several from invited authors who are senior scholars in the field. This is the third volume in the Global Research on Teaching and Learning English Series, co-published by Routledge and TIRF. JoAnn (Jodi) Crandall is Professor Emerita of Education at the University of Maryland, Baltimore County, USA. She is a past president of TESOL International, WATESOL, and AAAL, and a founding and current member of the TIRF Board of Trustees. MaryAnn Christison isProfessor, Department of Linguistics/Urban Institute for Teacher Education at the University of Utah, USA. She is a member of the TIRF Board of Trustees and a past president of TESOL International Association. The Global Research on Teaching and Learning English series, co-published by The International Research Foundation for English Language Education (TIRF) and Routledge, showcases research by scholars from around the world, whose research has been funded by grants from TIRF, awarded through a carefully vetted international competition. Since 2002, TIRF, an independent foundation started by the TESOL International Association (TESOL) in 1998, has commissioned and/or funded research on a range of topics associated with the teaching and learning of English worldwide. This series offers a collection of previously unpublished empirical studies conducted by grant recipients throughout the world, as well as chapters from invited scholars. Volumes in the series report on issues of current concern to the applied linguistics community and the language teaching profession, and present a wide variety of research topics investigated through a range of research procedures. Most chapters appearing in volumes in this series cover issues that motivated the research, context of the research, research question(s) addressed, data collection and data analysis procedures, findings and discussion, and implications for policy, practice, and future research. This chapter structure helps to achieve consistency and coherence across the volumes, while at the same time allowing each author to report on the unique contents of his/her own study. The authors and editors forego any honoraria so that all the royalties from the sales of this series can be used to support TIRF’s programs.